Press release from The Old Forge Day Nursery. The Old Forge Day Nursery is a family run Forest School Nursery that promotes a fun and homely environment for both children and staff. Set in the picturesque village of Findern, it offers children an exciting opportunity to explore outside with a fabulous garden, including a mini forest for our Forest School teaching. It is continually exploring new and innovative ideas and projects such as its Baby room project which enlightens practitioners and parents about their baby’s brain development, empowering practitioners working with young infants to be confident and passionate about their vital work. The team could not be prouder of its dedicated and passionate team who all work above and beyond in their roles, in what is what they consider to be one of the most important jobs there is – caring for our amazing children. Staff are very enthusiastic, immensely caring and establish highly positive, warm relationships with children. Staff are excellent role models, who have extremely high expectations of all children and celebrate their uniqueness. Staff manage children’s behaviour very successfully. They help children to understand, value and respect their friends. Inspiring members of staff teach communication and language skills extremely well. They talk to babies and hold purposeful conversations with older children. All children are highly confident learners and develop skills for their future learning and move to school. They are achieving above their typical age expectations. They have an extremely positive attitude to learning and are willing to try new things. 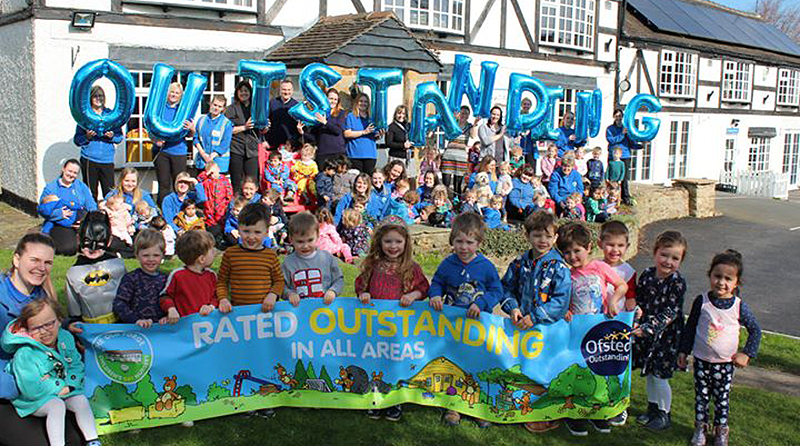 Staff strive constantly to ensure they are always providing Outstanding childcare and the nursery would like to thank all its wonderful parents and carers who are always so supportive and involved, which is so important and hugely beneficial for the children. Massive Congratulations to The Old Forge! Well deserved!